Coburn’s full range of optical coating materials are optimized with HCLT (Hybrid Cross Linking Technology) during lens lab production, which ensures the best coating adhesion, abrasion and yields and tintability. Request more information about our lens coating today by calling 1-800-262-8761 or filling out this form. 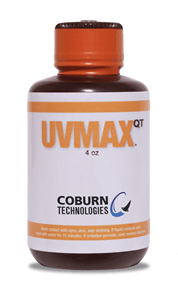 This fast curing, non-tintable, durable lens coating features excellent adhesion, low viscosity, great coating stability and a special bonding chemical formulation and unique UV/thermal hybrid chemistry. UVAR lens coating is optimized with HCLT (Hybrid Cross Linking Technology) during lab production, which ensures the best optical coating adhesion. Better filtration results in less impurities, which improves coating performance; and because it contains no volatile solvents it is safe for standard shipping and handling. No problem switching lens coatings; formulated for plug and play use. 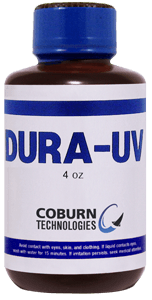 This fast curing, durable lens coating features excellent adhesion, low viscosity, great coating stability and a special bonding chemical formulation and unique UV/thermal hybrid chemistry. UVAR lens coating is optimized with HCLT (Hybrid Cross Linking Technology) during lab production, which ensures the best optical coating adhesion. Better filtration results in less impurities, which improves coating performance; and because it contains no volatile solvents it is safe for standard shipping and handling. No problem switching lens coatings; formulated for plug and play use. Tintable to a grey 3 while maintaining high abrasion resistance.